Are you a Chelsea FC super-fan? Someone who goes above and beyond to support the Blues? If the answer is yes, we are looking for fans like you. 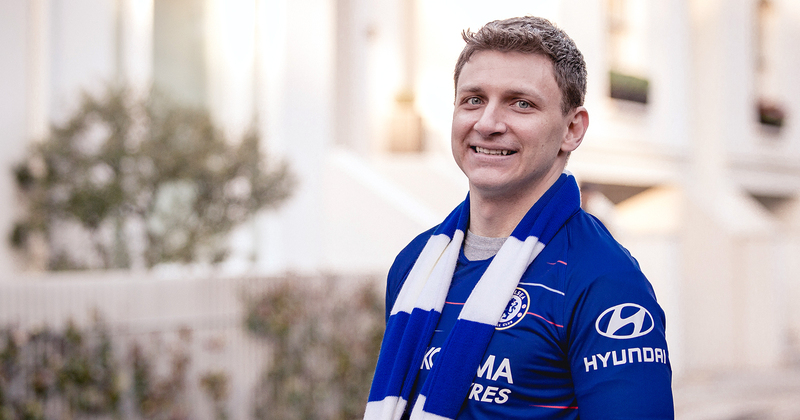 As an official partner of Chelsea FC we have launched The Extra Mile, a monthly competition to identify the fans who go that one step further in support of the club. The competition celebrates fans by acknowledging the incredible lengths they go to to follow their team and entries are officially open. Monthly winners will be rewarded with club prizes such as match tickets and official merchandise. At the end of the season, one lucky monthly winner will win the ultimate prize for any football fan; the opportunity to travel across Europe to watch each of Hyundai’s partner clubs in action – Chelsea, AS Roma, Atletico Madrid and Hertha Berlin. We have launched The Extra Mile with Jake Cohen’s story, a fan who epitomises what it means to go the extra mile. In May 2017, Jake flew from Boston to London just to watch John Terry’s last home game for Chelsea, flying straight back the next day for work. The very next week, much to the surprise of his friends and family, he travelled all the way back to London to watch the Blues play in the FA Cup Final at Wembley. Jake’s incredible story of support has been recognised by Hyundai, as part of The Extra Mile competition. If, like Jake, you have a story about following the Blues to share, ENTER below. Please note this competition is open to UK residents aged 18 or over. You can change your mind anytime by calling our call centre on 0800 981 981, or through the unsubscribe link in all our emails.